They explained the fire was spreading too fast since the house was constructed of wooden material and secondly, there was shortage of water to put out the fire since the village lacks pipe-borne water. Some relatives of the deceased and members of the community, who fought to quench the fire recount that they only realisedMolaEfinge who in his 70s had been reduced to ashes when fire had consumed the whole building. 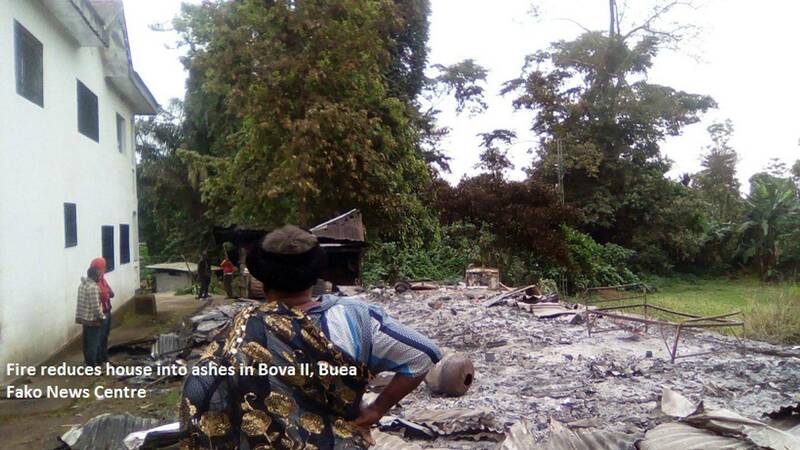 Going by tradition, the traditional ruler of Bova II Village, HRH Chief EsumaNyoki, ordered for his immediate burial the same night after the security forces had visited the scene to open investigation. The source of the fire was still not officially established by time of this report. Many are speculating the fire originated from an unfinished cigarette. What was gathered from the whisperings around is that the deceased was seemingly high during the day after consuming some few bottles of alcoholic drinks. It is suspected that he could have gone to bed with an unfinished stick of cigarette in his hand since he used to smoke. Some say the glowing flames from the cigarette could have ignited into full flames after getting in contact with his beddings, especially the mattress which is very inflammable. While inhabitants of Bova II were still to come to terms with the calamity they were facing, another member of MolaEfinge’s family, MokekeMoki died in the next door. However, talking to one of their relatives, Charles Moki, he noted that his elder brother had been sick.